Linear, ssDNA genome of about 4 to 6 kb in size. Equal amount of positive and negative strands are encapsidated, although the percentage of particles encapsidating the positive strand can be lower depending on the host cell. 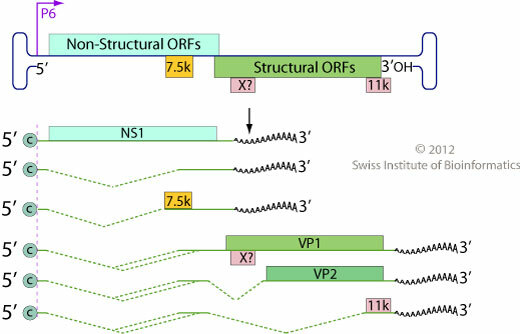 ORFs for both the structural and non-structural proteins are located on the same DNA strand. 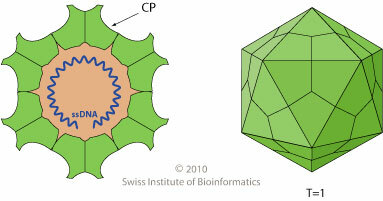 Host proteins transcribe the genomes into mRNAs. Alternative splicing allows expression of both structural and non-structural proteins. TROPISM Mitotically active erythroid precursor cells in bone marrow. ASSOCIATED DISEASES Fifth disease, skin lesions. Parvoviruses infection induces host cell death, which is often directly associated with disease outcomes. B19V NS1 and 11kDa proteins induce apoptosis via the activation of caspases . B19V also induces G2/M checkpoint arrest .